In his unboxing video, he mentions that he filmed it on October 28, and only got to release it on November 2. He also mentions that he needed a sort of go ahead or green light. This lead to number 2 on the list, which is..
2. It wasn’t a Taobao leak. It seems more like it was an gift from Nerf’s PR. With the above words and terms being used and thrown, I get the feeling that he’s under some sort of NDA just like how MyLastDart was. 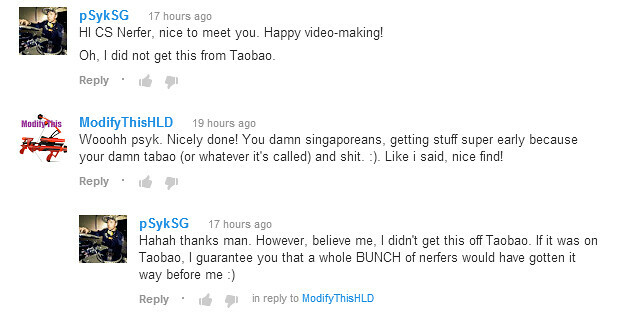 PSYK makes a good point with how if it WAS a Taobao leak, a bunch of Nerfers would already have one. 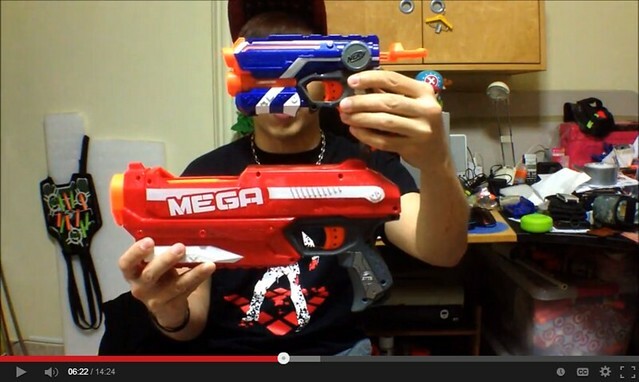 However the Mega Magnus has leaked on Baidu/Taobao. Nerf must have really kept this blaster on closer lock then others in the past, since we don’t have many of them leaking online. Also, note the orange trigger on the blaster, instead of the normal grey ones international ones blasters seem to get to signify the weaker versions they get. 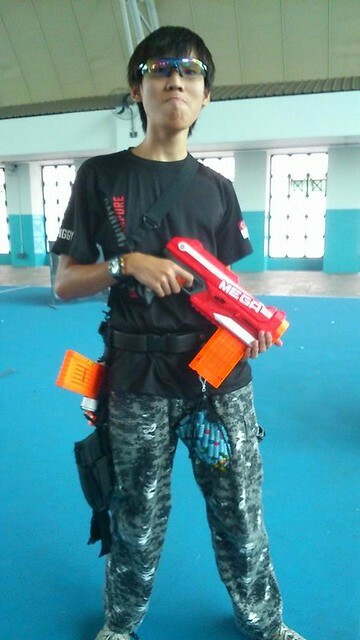 Singapore gets orange triggers on their blasters though. November 3, 2013 6:40 PST Edit: An “anonymous” person from Singapore sent me this email. The Nerf Magnus was indeed given by Hasbro Singapore PR. As far as I know there is currently only 3 in Singapore. Do keep a close watch at the upcoming Nerf at Kampong Ubi CC sponsored by People’s Association and Hasbro Singapore event as more of it might be appearing as prizes for the event. How true or false this information is remains to be seen. EDIT #2: According to a game organizer who contacted me for the event mentioned above, the Mega Magnus blaster WILL NOT be a prize for the upcoming event. Also since PSYK told me he DID NOT get his Magnus blaster from Hasbro/Nerf PR, the rest of the information above is most likely false. To view more info on this upcoming Singapore Nerf event, please check out nerffiesta.com. 3. But where he got it from exactly is still a mystery. After the speculation though, it’s still a mystery as to where he got it. He won’t say exactly where just yet, but it seems like he’ll reveal it in the near future. So again, it’s still a mystery as how where he got it from, but the how is more or less there. 4. It’s a big blaster, and we now have a sort of scale comparison. He uses the Elite Firestrike to show off and compare the new Magnus’ size. He also says that it feels comparable in size to a Recon or Retaliator. 5. The Magnus has a big slide to prime back, but it’s easy to prime. The slide that is used to pull back to prime the blaster seems pretty big in size. But the draw is on the shorter side, and it’s much shorter then the Centurion’s. This should help increase it’s effectiveness in games. 6. It’s much easier to mod then the Mega Centurion, and it already has been. PSYK commented back to a viewer saying that the Magnus is much easier to modify then the previous Mega Series blaster, the Centurion. This is going to be a Mega plus (see what I did there?) for the modders, especially when you take into account number 7 on this list. 7. It features a Direct Plunger. As many of you know (or don’t know) direct plunger blasters have more power and are considered by many easier to mod then things like reverse plunger blasters. Yes, it can be modified to fire Elite Darts, as evidenced by point number 8 on this list. 8. A few others might have it. The first photo is from an instagram user named lt_sarcasm from Singapore. Apparently he already has one as well. 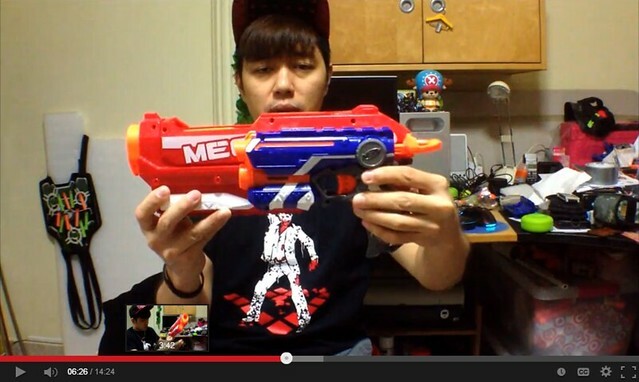 He’s also modified it already to accept and fire Darts from Nerf’s clip system. It could be possible that other people from the area have a Mega Magnus besides PSYK and lt_sarcasm. November 3, 2013 6:40 PST Edit: Apparently after word from lt_sarcasm, the blaster isn’t is, it’s PSYK’s. The second photo isn’t lt_sarcasm, it’s another person. PSYK brought the blaster to a Nerf War, and some people there posed with it. If you have any more new media on the Mega Magnus, feel free to contact me or share it here! With all the influx of information and media on the Magnus, it seems like the blaster will be coming out sooner then later. That is so funny that you grabbed my comment, I am Mica T.
Haha well, thanks for your comment then. As you can see it helped us discover some new information about the blaster. BTW any internals pics yet? I wanna see how much Volume the plunger tube is. That will tell us how much mod potential this Red beast has. No internal photos or video of them yet, but I’ll be sure to put them up when they hit the net. Only #4, 5, 6, and 7 actually have anything to do with the Magnus. Hey Bob, thanks for the heads up on that. The previous title was a working one that I had planned, but I decided to head another way with it and forgot to amend the title. 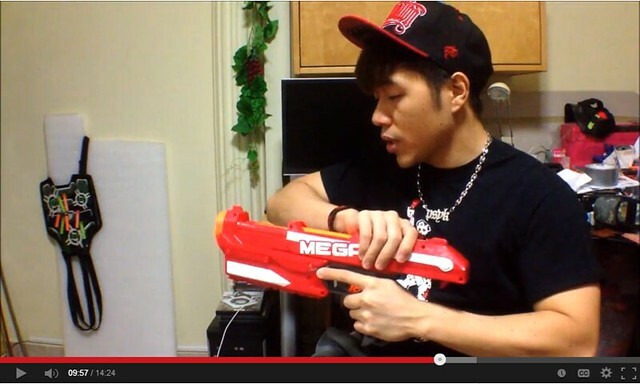 The title is now “8 New Things We Learned From PSYKSG’s Mega Series Magnus Unboxing Video”. Apologies if I mislead you, and I’m double sorry if I wasted your time. Wow, that’s much bigger than I thought it would be! Looks pretty cool.